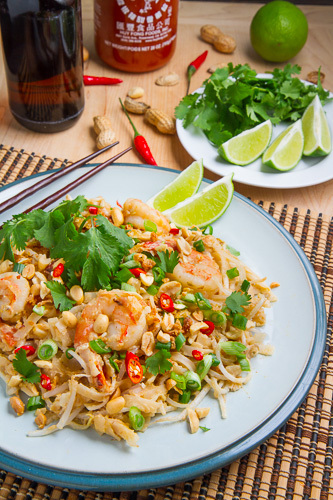 ‘Pad Thai’ fried noodles and shrimp is a spicy peanut sauce. I am a big fan of Thai cuisine and one of my favourite dishes is Pad Thai with another being anything with a Thai spicy peanut sauce and the was wondering about combining the two! The basic idea was to use all of the ingredients from pad thai including the rice noodles, shrimp, egg, bean sprouts, etc. and replacing the tamarind, fish sauce, palm sugar and chili sauce sauce with the spicy peanut sauce. This recipe is pretty much the pad thai recipe with peanut sauce and it is pretty easy to make. One thing that you want to do is to have everything prepared ahead of time as once the first ingredients hit the pan, everything is done in only a few minutes. The spicy peanut sauce works really well in this stir-fried noodle dish and although it is not pad thai it will definitely be making many appearances on my table! Serve with lime wedges and extra sriracha for those that like it hot and spicy! Cook the noodles in water as directed on package until just pliable. Add the shrimp, shallots and garlic and saute for 1 minute. Add the peanut sauce and noodles, mix and move to the side of the pan. Add the egg, let it set a bit and then mix it into the noodles. Add the peanuts and bean sprouts and cook for a minute. Add the green onions and cilantro and remove from heat. Great weeknight meal and I love the spice! I love Thai food. Love it! Especially when it's spicy!! This is my kind of meal! One of my favorites, after traveling in Thailand and getting hooked on it. Your version looks incredible! Love me a good pad thai & your looks wonderful! I love Thai food! It is so nice when you can make it at home and cut make on the crazy amount of oil my local Thai restaurant uses. I just ate breakfast and now I want lunch!! I love that you combined them – genius! This looks absolutely delicious! For some reason I've never made pad Thai, even though it is one of my favorite comfort foods ever. Thanks again for the inspiration! I'm a huge fan of Thai cuisine as well, peanut sauce-I cant' do, but who cares, because I can make it the sauce using walnut oil an cashew butter. Love this version, Kevin!! looks amazing! This is such a fun idea! I'm always up for infusing spicy peanut sauce into everything! 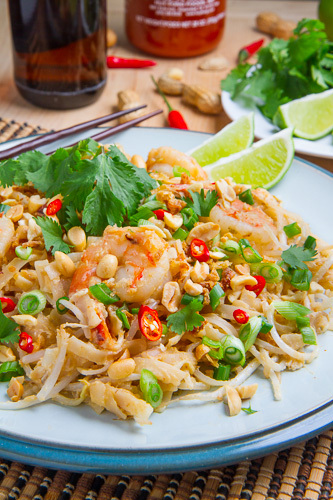 What makes this Pad Thai rather than just peanut noodles? Anonymous: According to the wikipedia (http://en.wikipedia.org/wiki/Pad_Thai), the origins of the dish are Vietnamese and it was imported into Thailnad and adapted to Thai tastes. 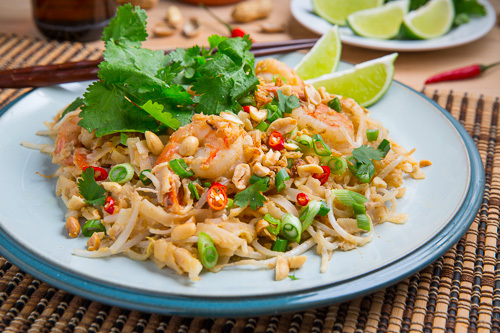 A few years ago the Prime Minister of Thailand renamed the dish to 'Pad Thai'. It would be helpfull if you made your recipes printable. Anonymous: Just hit the "Printable Recipe" link above the Ingredients for a printable version. This is a really great, simple recipe. Mine turned out fabulous!! Thanks for posting this! I've made this for years. I never had a recipe and had to try and remember all the ingredients. My son requested this for Christmas dinner. Luckily I found your recipe and didn't have to strain my brain in recall. Thank you it was as good as mom's??? ?